TIMES UP. WINNERS TO BE ANNOUNCED IN NEXT POST. Before we get going with the work for Week 4, I want to announce a slight change in schedule. Originally this was going to last for 6 weeks. I'm changing it to 7 weeks so as to give 2 weeks for the quilting phase. That just means an extra week of giveaways. Unless you have a problem with that. At this point you should have all of your quilt blocks. As per prior discussion both here and in the Flickr group, the number of blocks that you ultimately have varies. I have a total of 39 12.5"x12.5" blocks and 13 7"x12.5" blocks. Some of you may have 42 blocks. Others may have more or less. It doesn't really matter. What does matter is what you do with them. Since I have 39 blocks I have decided to use 36 of them in my large quilt. Six blocks wide by six blocks long. With the remaining 3 12.5"x12.5" blocks and the 13 7"x12.5" blocks I am going to make a smaller quilt. A smaller quilt to practice my quilting on before I tackle a larger project. 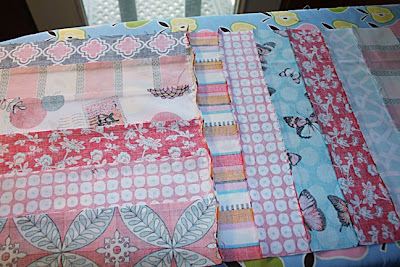 With my total number of blocks that I'm turning into a large quilt top, I want to randomly organize them. Just do whatever you have to do so that no two of the same blocks end up side by side in the final quilt. 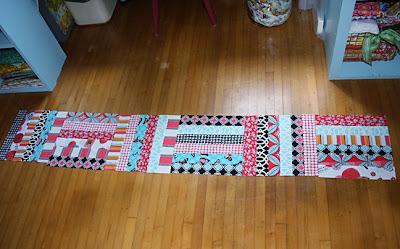 As I stated, my quilt will be six blocks long by six blocks wide so I grab six blocks to start my first row. 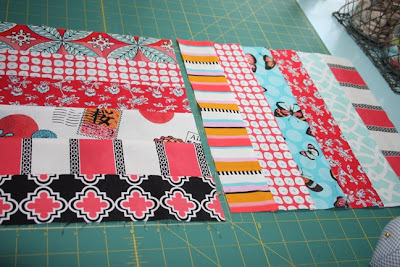 Lay out your blocks as they will be sewn together into a row. You'll see that each block is turned 90 degrees from the previous block. In other words, the first block in the row has the strips going north and south while the second block they are going east and west. Now begin sewing the blocks together. Right sides of fabric together. Line it up and pin it. 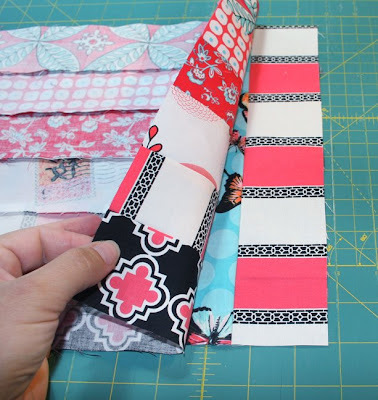 Keep in mind that if your block that is underneath has seams wherein the pressed seams are facing counter to the way in which you are going to sew, that you will want to keep these flat as you are sewing. 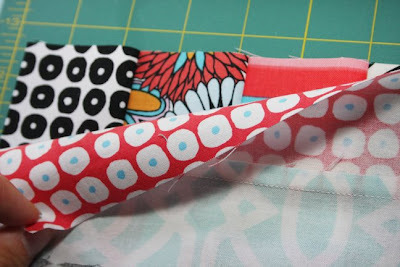 You don't want them to flip and be twisty once you are done sewing this seam. Hang with me and you'll see more explanation further along. Now you're ready to sew on the third block in your row. Again, right sides of fabric together. You'll notice that this time I pinned it more frequently than the last time. This is because of the seam-folding-twisty-thing that I was just talking about. At each arrow in the photo below there is a seam. 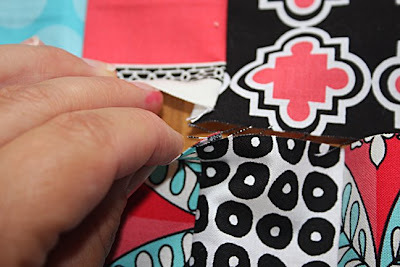 If you were to see the back side of where those arrows are pointing, you would see that the pressed seam is pointed "north" in the direction in which it will feed through the sewing machine as you sew on the next block. So, I pinned at all those points to make sure that they don't do that folding-twisting-make-my-final-quilt-top-not-lay-flat-thing that they could do if I'm not careful. 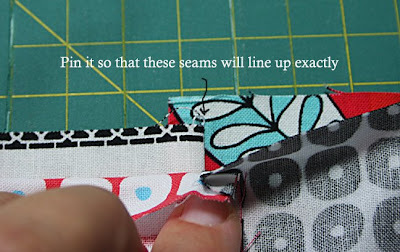 Then you are ready to press all of those seams created from sewing the blocks together. Press them all in the same direction. Lay your first row out. Lay your blocks for your second row next to them to make sure that you have rotated your blocks correctly so that they too are opposite of the first row. Study the next two photos if my oh-so-clear explanation doesn't make sense. 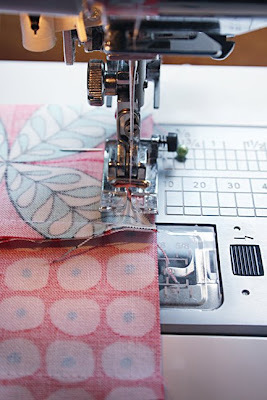 Sew your entire second row together following the same procedure as your first row. Once your second row is complete, pressed and ready to go, it is time to join row one and row two. 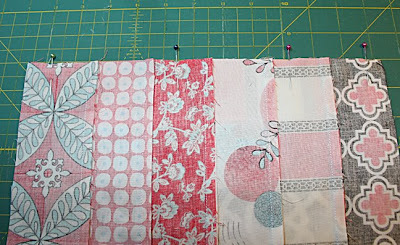 A moment ago I discussed how the block seams should be pressed the opposite way in row two as they were in row one. This become important now as we go to join the two rows. 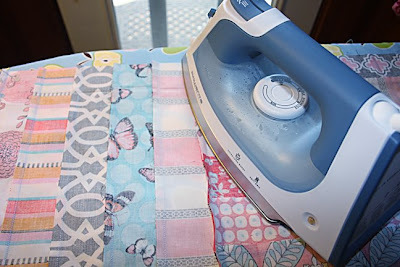 Lay your rows on top of one another with right sides of fabric facing each other. Obviously you want to line up the edges but the really important thing here is lining up the block junctions precisely. 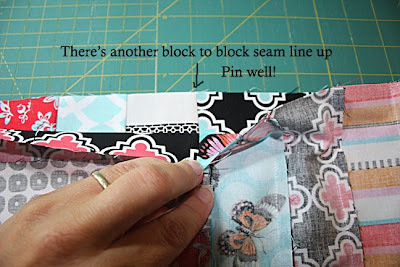 So, as you begin pinning your two rows together in preparation to join them by sewing, start with your first block junction and make sure that they line up precisely. Pin it well. Then work back to your left pinning and lining up the fabric. Then on to your next block junction. Pin it. 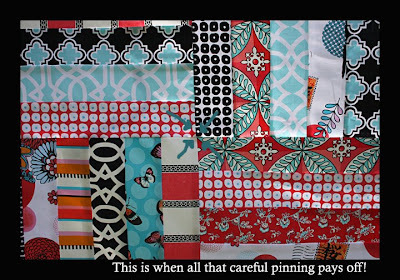 And again, work back to your left pinning and lining up the fabric until you get to the point where you meet your other pins. Keep at it until your whole row is pinned. Then sew it. Even the back will look pretty. All those carefully sewn and pressed seams will yield a nice and flat quilt top. A nice and flat quilt top makes the actual quilting of it easier . . . the final result prettier too. Ok. So keep repeating this process until your quilt top is complete. And don't fret. Or dispair. Or freak out. I remember thinking that assembling a quilt top took forever. But then I did more. And got better. And got faster. And learned my own tricks for making things work. It's just like anything. Practice makes perfect. I'll give two people the best batting in the world to make their completed quilt. I only use Warm & Natural batting. It is 100% cotton. It doesn't bunch or separate. It gives the final quilt that nice wrinkly, crinkly antique look that I love. And it keeps it shape wash after wash. I love this stuff. And you will too! Leave a comment here to this post before 7:00 pm US EDST on Wednesday, June 10, 2009. I'll pick a winner by random draw soon thereafter. Only one entry per person. International entries welcome. Peace. Love. And quilting, baby! Love it! Why does your quilt top look so much happier than mine? Giggle! I know why...trying to use up fabric that I look at and say...What was I thinking when I bought that?! I love that I'm the first to comment! for the extra week. I'm away from 6/13 to 6/27 .. you've just made my life easier! Hey, I WAS first. Guess someone beat me to the "send" button! 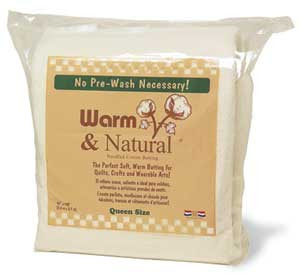 I always use warm and Natural, Love it!!! Can't wait to start the top! So pretty. I hope mine turns out that well. I'd love the batting. Can't wait to start piecing things together. I have got to get my fabrics cut and get with the program!! Wow, an extra week of giveaways...I dont. know. Yay! I am so inspired by the QAL - thank you. I haven't sewn a quilt (or much of anything) for 7 years - so this is huge...Thank you. Really. Your quilt is very pretty. I am making my own quilt right now, I just didn't start with you. My next quilt will definitely be this kind!! I love the rows, more than the squares I am doing! An extra week of giveaways works for me! Plus, since I am already behind, I am so happy to have an extra week to catch up! oy, I still haven't cut out my strips but I'm determined to catch up! An extra week might just do the trick though. Thank you! That fabric looks so pretty in this pattern! I'm behind. Alot. But I'll catch up and pull some allnighters if I have to. LOL! ohhhh, Dana...LOVELY quilt! This is turning out to be so much fun...my first quiltalong. Warm & Natural...love it! Thanks for all the giveaways. I don't want to go on vacation tomorrow!!!! I was so excited to be caught up, and now I am behind again. Don't think DH would cancel plans, do you? This is so much fun. Thank you, thank you, thank you for putting this together! I'm afraid I'm a little behind on the sewing part. Your quilt is gorgeous! Thanks for the give away. I also have 42 blocks, so I haven't decided just what to do with them. I am getting nervous about the quilting. Do you quilt on your domestic machine? I really haven't tried that yet--oh me, oh my! wow! I love your top! 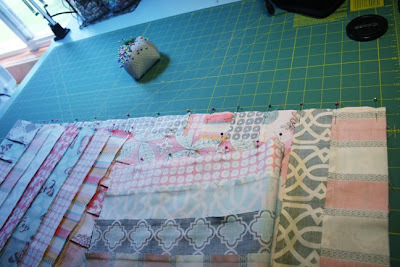 I can't wait to get mine all sewn together...I am glad for the extra week! My hubby was in an accident this week and we just got home from the hospital yesterday, so needless to say I am a little behind. Thanks for the giveaway!!! Just found your quilt along and can't wait to catch up. I don't know what to be more excited about, the quilting or the giveaways!!! Your instructions and prizes are awesome! Thanks! I only use Warm & Natural batting too. It is absolutely the best. Wow, that quilt top is gorgeous. I love the black and white with pops of bold color. I ended up with 42 blocks, so I'm trying to decide if I want to do 6x6 or 6x7. I just found your quit along and I love it already! I'm hoping to get some fabrics together and start working on it. The giveaways are awesome too. Your quilt looks so pretty, I love the fabrics. Can't wait to get that far on mine! :) Thanks for the giveaway! Oh, this is the fun part for me!!! I'm so glad you went ahead and posted this one today - I just thought I would check to see, and there it was! I will get to work on it tomorrow... Woo Hoo!!! I can't wait to see my blocks come together like yours have. I love the colors in your quilt, but I also really like mine, I think it's the yellow! weee! love the EARLY POST FOR WEEK 4! Ooohh...your's looks fab...and I like your fabric SO much better than mine. DANG IT. But maybe once I get all the squares together it will look better to me.....of course it will. Your quilt top is awesome! Thanks for the warm & natural batting giveaway, too. Your quilt top looks beautiful. I think I am going to have to "step out of the box" and try something other than the traditional fabrics I have been using in my next quilt. Please enter me for the warm and natural drawing!! I love your colors! I wish I had done the same mix. I also love the warm and natural. I buy it off the big roll. Its the best! Thank you so much for having the quilt along! I have always wanted to try to make a quilt. Warm and Natural is my batting of choice as well. Your quilt top looks awesome! And I am loving how we get to see everyone's quilt in progress in the Flickr group. They are all so good. 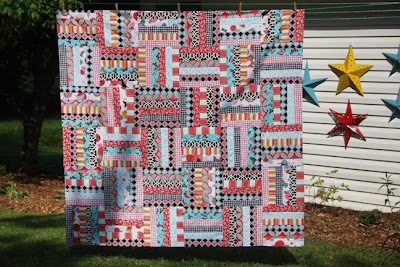 It's inspiring to see one quilt made with so many different fabric choices! Gorgeous! I'm just getting started on my quilt but am super excited! Oh, I have to say, this is so much fun! I have 48 blocks ready to go! I appreciate the extra time to get it quilted- as a newbie to large quilts I was always so scared to do a big one- but this is making me feel like a June bug at a porch light sale! All happy with the possibilities! Thank you so much for all the pictures and easy to follow instructions! Yeehaw! I haven't been able to participate in your quilt a long because of my "full plate" of current projects...but two other quilts are part of my full plate, and they both need batting, so...! :) I'm a loyal Warm & Natural user, too. Batting is needed over here! Oooh your quilt top looks amazing!!! I am not quite done cutting out my blocks yet (teething baby put a cramp in my style!) but I can't wait to get moving and get to this step! I've never heard of that batting before. Where have I been? Sounds great though! I am excited to have joined and cannot wait to catch up!!! Here's hopeing I win the batting!!! I'm a cheapskate so it would be nice to see what the best batting in the world is like!!! Your quilt looks lovely. Even on the back! Wish mine looked so good. Wonderful fabrics! I love your one really graphic bw print that just sparkles and spins the eye around! Am inspired to get started on my own, and would love the batting!! Wow!!! 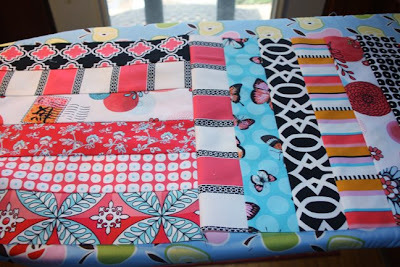 Your quilt looks amazing - I am a little behind on this quilt along - decided last week I just couldn't watch anymore - but I had to participate - well my fabric has been ordered from Etsy and I can't wait to get it in the mail and get started!!! Yeah!! And thanks for the tip about Warm and Natural - if I don't win it at least I will know what to buy. I love the way your fabrics all look together. I'm a little behind on my quilt, so thanks for the extra week. And thanks for all of the fun giveaways! 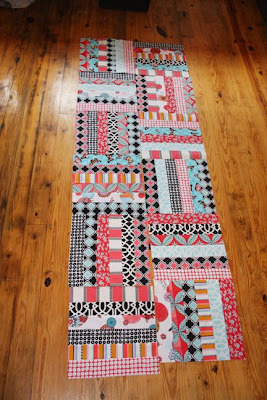 getting inspired to make my first quilt....maybe I can do it! Fantastic! Love your quilt top! Can't wait to finish mine. And would LOVE to win the giveaway - thanks! Your quilt top is looking great, Dana. I love the fabrics you chose. I've never used Warm and Natural before, so I'd love to try it. Thanks for counting me in. Free batting? Warm & Natural? You don't have to tell me twice! I also only use the 100% cotton stuff. Why mess around? I'm a few days behind, still, but catching up! Strip sets are almost all done, then just have to cut 'em into squares and assemble! Looks like I'll have the full 42. This is going to be BIG! I can't wait to sew the pieces together! love the vibrant fabric choices! Love Warm & Natural. Can't wait to see how my top looks. Nice job on the tutorial! And your quilt is SOOOOOOOOOO cute!!! I love Warm & Natural too- even more if I win some!!! I have been pressing seams open like Oh Fransson! did in her quilt-along. Just love the look at the back. Thanks for the great giveaway. How exciting to see it come together! Quilting virgin here. I have all my blocks cut and they are so lovely that I can't wait until it's finished, so I can make my bed happy. Thank you for such wonderful instructions. I have my blocks cut and am ready to start sewing tomorrow. I really appreciate the extra week for quilting. I was expecting to need it too! Your quilt is awesome. Off to begin sewing rows! Thanks for the giveaway! Batting! Fantastic. I love this kind too. I'll be out of town this week so the extra week is GREAT! Thanks for hosting. I'm still piecing together my strips, but I will get there! I think I will have about 46 blocks total, but I do like the size your quilt looks. And I love the movement the fabrics make when each block is turned 90 degrees. So cool to get a chance at free batting - woohoo! It's coming along nicely. I like your fabric choice. I've never used this kind of batting and would love to give it a try! Your quilt top is fantastic!!! 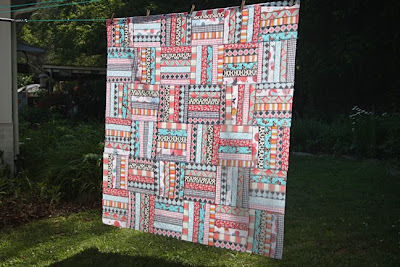 I love the colors of Flights of Fancy and your quilt pattern looks so pretty and cozy already! WOW. Love the way it came together! I just finished sewing up my strips. Plan on cutting them up tomorrow, and then onto the sewing. You instructions are impeccable! I was just thinking tonight while ironing that it's good to have a 'deadline' each week. It keeps me on schedule and hinders me from procrastinating trying something new! I'm so glad I'm doing this! And I'm really happy I get to keep this quilt! Now that I've got an idea about the outcome of the strips I do believe I'll join in, nothing ventured nothing gained. Besides I really like the look of this quilt so far. I'd love to try the Warm & Natural...thank you for the chance to win! I've had every obstacle to my quilting. I found I have no rotary cutter. 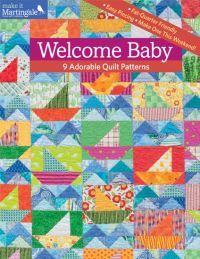 Found your site & thought I'd try to catch up and just cut out strips with scissors, got distracted by some triangles for a baby quilt. Went to piece the baby quilt, hubby turned off electricity to just the sewing machine (remodeling house stuff). Can you see me pulling out my hair??!! I would love to win, but I know that whoever does, will be blessed!! awesome giveaway! i'd definitely use that batting! That is such great batting! The only kind my mom and I use. And I absolutely love your quilt top! This quilt is on my list of ones to do, just have to get thru the others first! Love LOVE LOVE it!glad to see I am not the only one that is so far behind. Still scared to cut my fabric lol! 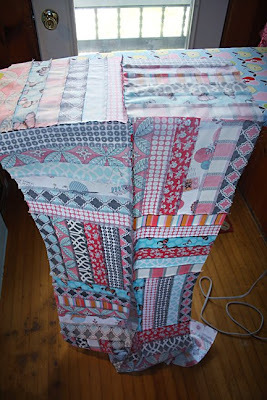 I love how your quilt has come together! Very cute! I'm hoping all of my seams fit just as nicely as yours did. I'm really enjoying this quilt-along! Thanks for the opportunity to win the batting. I haven't used that kind before and would love to try it out! Thanks for another chance to win a great prize. Love the fabric combo! And excellent tips for keeping things neat on the back. I find a lot of people skip this extra care but it makes such a difference! Thanks for the very clear instructions. This is alot of fun and the end result will be great ! Your quilt top turned out awesome. And I love clothesline shots! I hope I'm not too late to sign on for the Quiltalong. I'm using the same fabric, so it is great to see what it will look like this week. Thanks again for the wonderful giveaway! Thanks for the extra week, I can use the extra time for sure! Running a bit behind and still need to assemble my quilt blocks but I'll get there soon! Thanks for the give away. 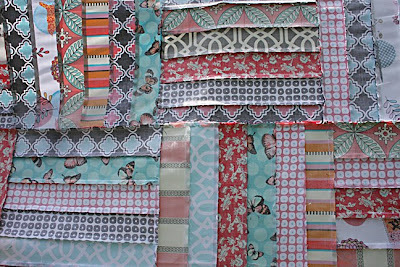 I couldn't wait--I was so full of energy for this project, I've been sewing my blocks together for two days. I've got 90 blocks, all from my "yellow" bin, so it will be a queen sized top for MY OWN bed. That's a first for me. Seem to always make charity baby or twin quilts. I'll call it "Summer Sun". I'd be glad to try Warm & Natural for this summer quilt. This has been so much fun. I love your quilt top as well as all the lovely ones I've seen in the Flckr group. 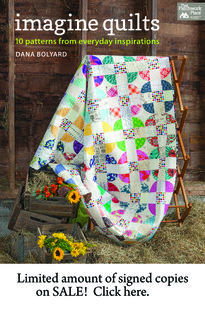 I'd love to try the Warm $ Natural for my very first quilt! I am still a bit behind, still sewing strips. I decided to make a queen and I started 2 weeks late, so have about 1/2 of the strips sewn, maybe I will be able to get caught up this week! I'd go batty without good batting! Please sign me up for the giveaway! I'm loving the quilt a long! I'm knee deep in company and other projects, but loving seeing it all come together. You are a great tuter! :-) I can't wait to seee how mine will turn out. I love your fabrics! I love this batting. I can't wait to see the completed quilt. Thanks for the clear instructions and beautiful photos. Your quilt top looks great. Your quilt is fabulous. I can't wait til I've got mine all put together. I've never used that type of batting. Hope I win so I can give it a try! I just want to say thanks so much for all the pictures and explainations. I really appreciate it. I love Warm and Natural, I use it in my stitchery's. I make alot of pillows out of them so I can attest to the fact that it doesnt bunch up. Thanks again for all the details. Time to sew!!! Your quilt is looking so cute! You stopped being distracted and got back on track just in time. Thanks again for this quilt along. It has been so fun so far! That looks sooo good!!! You are so clever. I'm sure you could make any fabric look a million dollars with your style. Well done! You are awesome! I'm getting a very late start, but better late than never! Love Warm & Natural. I also love my Shape Cut ruler for cutting strips. This is fun! I have been so busy at school. This has been a stress reliever. Thanks! Thanks so much for this detailed Quilt-A-Long! Love your tutorial - thanks for that! And thanks for the givaway - always fun to enter - would be even more fun to win! Great colors in your quilt top! Your quilt is so pretty and colorful! Your quilt is so fun and bright! I hope mine looks that good! I love your quilt! I can't wait until mine is that far! I like warm and natural batting too! It's the best. 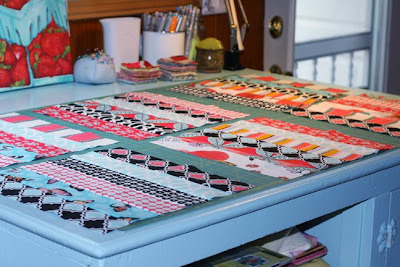 How fun for me that I am using the same fabric as you and I get to "see" my quilt before I sew it! And another week of giveaways is marvelous! I'll be at the beach for the next two weeks without my sewing machine but I'll catch up and make my quilt top when I get back! Wow...that's great!!! 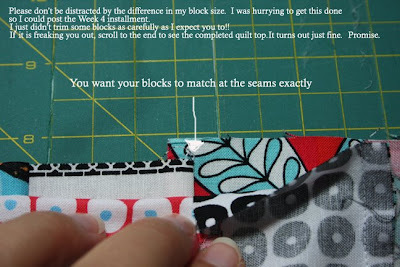 Your blocks look really nice sew together. Looks great! And I love any chance for more giveaways, extend as much as you like if it means more prizes! I've had a very busy week and haven't had time to sew my stripes together, but I'll be working hard this week to get it ready. So pretty! I can't wait to finally get started on mine! 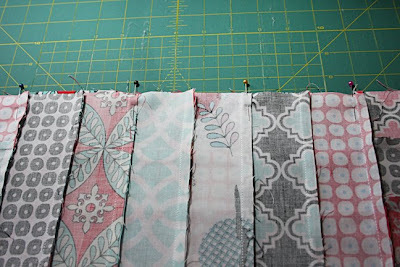 My blocks are ready for sewing - I am having so much fun with this. Thanks Dana and thanks for adding an extra week for qulting time I will need it!!! I'm a week behind. I'll be playing catch up the next 2 days and very happy about the extra week. too. Aloha & I would love to be counted in on your Warm & Natural giveaway! 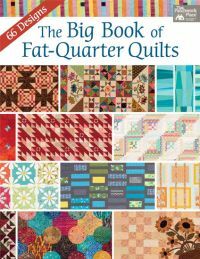 The colors in your quilt are so beautiful & this pattern looks like something I REALLY will try! Thanks for the inspiration! I'm a beginning quilter. I love your tutorial. I would love a new quilt for my bed so I may have to try this one you have posted. Your fabrics are wonderful! I'm working on a baby quilt right now for a friend. I'm going to blog about it tomorrow if you get a chance to stop by (I need to take some natural light photos). I'd love some advice! I haven't started cutting since I'm moving this weekend, but this quilt will be my first one in my new house! Can't wait! Thanks for this awesome quilt-along. Count me in for the batting giveaway. Your quilt top is stunning. I've never used anything but Warm & Natural so I can't compare it. But I do love it, that's why its the only stuff in my quilts! Love the quilt top too! That's going to be awesome to wrap up in! So I just ordered my fabric for the quilt along, and I have a lot to catch up on, but I'm excited. Hopefully I can win some batting! I LOVE the quilt! I love Warm and Natural as well. Thanks for the chance to maybe win this! I am so excited. 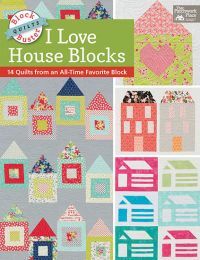 I'm loving your quilt top and can't wait to get started putting my blocks together this week and see what I come up with:) Thanks for the extra week that will definitely help with the quilting part. And count me in for the batting giveaway....who doesn't love warm and natural!! Hi! Warm and Natural is my favorite, too. Love it! Thanks for the entry! I absolutely love this quilt along. I have all my fabrics and will be following your quilt along, but I have to wait 3 weeks first to complete my teaching degree. Nearly there though. At the moment the thought of this quilt along is making me smile every day. I need to get busy! 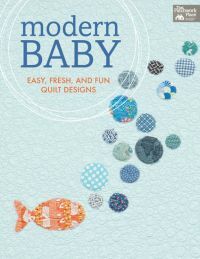 I'm working on a baby quilt as well and now I need to get caught up with my strips and blocks. But the batting would be GREAT! Thanks!!! I am having such fun - I love looking at all the different fabrics in the flickr pool, it's amazing to see how everyone will have the same quilt but all so very different. warm and natural is my favourite batting too - count me in for the giveaway! Since I was smart enough to decide I wanted a bigger blanket & I used 12 full yards instead I am still sewing strips/cutting blocks, but I can't wait to start laying it all out & sewing the top together! I^m a new quilter and am still looking for the right batting. thanks for the tip! Haven't quite gotten all my blocks cut out of my strips >_< Ah well, thanks for the extra week and the giveaway! I still haven't sewn my strips together! I need to get with the program. By the way, I used warm and natural on my last quilt and it turned out beautifully! I still haven't even cut out my fabric yet. I really need to get cracking before I am too far behind to catch up. 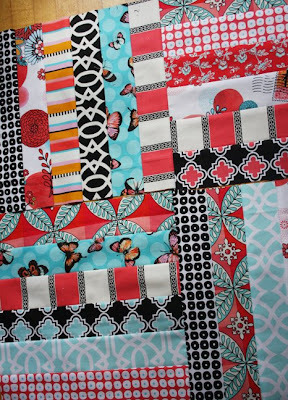 And I am loving the way your quilt top came together, it looks beautiful!!! Yippee! I can't wait to see my quilt top together...I'm dreading that part...I'm one of those newbies who feels like making a top takes for-e-ver! That doesn't look too hard. I think I can do it. Assuming of course that I find time to go to the fabric store and acquire supplies. I love warm and natural too. Your quilt looks fantastic, I'm still waiting for my fabric to come from USA, I'm in Australia. Lucky I'm not a beginner and can whip it up quickly. This has been a great quilt-along. Thank you so much for hosting. I love your top and my christmas top, too! I am glad for the extra week. i love the quilt that you made! i will have to try doing that one!! p.s. Automatic music on blogs is bad. Baaaad!! Hey Dana! I love how your quilt is shaping up, the colors look so pretty together. And the stars on your wall outside are just great too. Thanks again! Love reading your quilt-a-long. I'm not participating, though, but after my birtday (I've asked for several quilting supplies) I will surely use your explanation to make a quilt. I noticed the stars, too! I love them! The fabrics you chose are very nice, and your explanations are detailed enough for me to understand! Thank you. The fabrics you used are beautiful. I love it. I would love to try this batting! Thanks for the giveaway. I am also a fan of Warm and Natural (I think I often find myself using Warm and White because I put a lot of white in my quilts). I buy my fabric on sale, clearance, or at the surplus store where it's cheap, so the batting is always the most expensive part of the quilt! Thanks for the chance at the giveaway. So pretty! I'm going to have to do a huge catchup week with end of school activities taking a toll on sewing time. ooohhhh....your quilt top is so pretty! 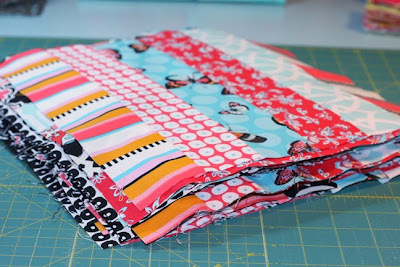 I'm having so much fun seeing everyone's fabrics being put together on flicker! 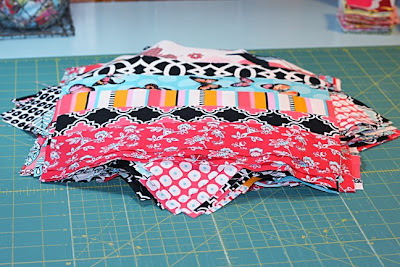 I have 48 blocks since I used 14 fabrics instead of 12 so I"m making my quilt 6 blocks X 8 blocks! I actually have someone in my town who has a free arm quilting machine - who knew? Thanks for the chance to win this wonderful batting! I love the Warm and Natural. I think it makes a nicer quilt. I wish I had used it in my first ever quilt. I can't wait to put my quilt top together and see what it's going to look like! It's so great to be able to make this quilt with such a great group of people. Thanks for all the work you are doing!! Oh yeah ... hope it win the batting! Love all your quilts! I always get stuck on which batting to use...will try Warm and Natural with this quilt...hope I win it!! great color combos.. so far so good.. love the giveaway this week once again.. great batting use it often. We've got a lovely rainy Monday - Perfect for row sewing!!! Thanks again for the motivation! the top is so pretty! i am so excited to get mine laid out. i love your hardwood floors by the way. Your quilt is going to be gorgeous. You make it look so easy! I LOVE Warm and Natural and Warm and White.... I remember when they first came on the market and it was so fun to sew with. I wasn't quilting then, but I dyed the batting and used it to make reindeer and Santas, etc. It's really much more versatile than you would think. Thanks for a great quilt-along, Dana, I'm having fun playing catch-up! I feel like I am making the quilt just by watching your step by step explanations and photos. So does that qualify me to receive free batting, maybe then I'll dig deeper for time to make a quilt?? I am loving this quilt and the fact that a large group of people are doing it. I also love this batting. Thanks for adding an extra week -- I hope that'll be enough for me. I love warm and natural! And yes, I am a bit behind. I hope I can catch up this week, I've only sewn a few strip together so far! I have seen this product but haven't used it. Thanks so much for this quilt-a-long and all the fun I'm having with it. I have to stop myself from constantly looking at all the lovely work I see. I'm learning so much and having fun - I know it must be hard work for you to have done this - but THANKS! I use and LOVE Warm & Natural batting. I LOVE your quilt too. Your quilt is beautiful! I also have enjoyed all the great pictures on the Flickr group! I LOVE that batting and I really need some! BTW, Thanks Dana for doing the quilt along. This is so much fun! I use only Warm & Natural too! It definitely is the best I've ever used...and so soft, and comfy!!! Yay! Another great giveaway & a fun week sewing with other great ladies. Thanks so much! I love how your top came together. So bright and happy! Thanks for the chance to win the batting! Wow - oh yes please count me in - that would be perfect for the quilt I am making my son (my first quilt actually) I love the fact that it's 100% cotton. The quilt has a great visual effect. Fabulous job. I found warm and natural last year, love that stuff. Your quilt is fabulous! Thank you for all the great direction. I can't wait to get my quilt put together. 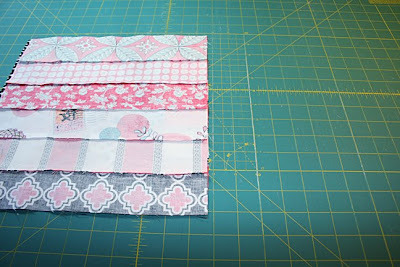 I'm so excited to see this week of instructions since I'm also using FOF summer and now I have a little preview of my final top look :) Dana, when this quilt along is finished can your awesome daughter lead the next one? I've love to make her quilt block design (seen in the previous post) for a quilt! Love you quilt. I love warm and natural it is what I use. 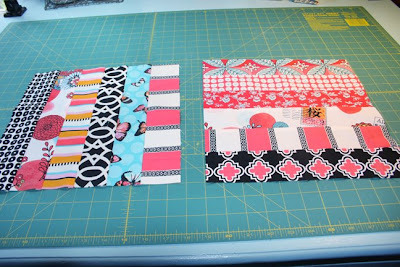 I can't wait to catch up my strips are sewn but I am only half way done cutting up my blocks. Yours looks great. I am having so much fun doing this! I can't wait to get to stitching my blocks together! I really love the fabrics you are using. It is making a really pretty quilt. Your detailed instructions and photos are really helpful. Thanks for all your hard work. 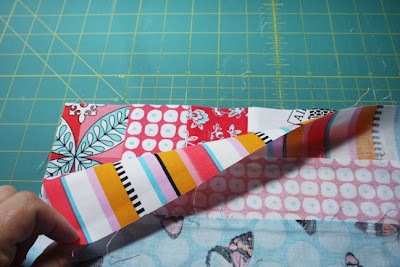 I'm so excited to see a Flights of Fancy quilt, I'm using that fabric for one of my virtual quilting bees. Thanks for being so generous! I have always wanted to try "Warm & Natural" but have been too cheap to give it a go! I would LOVE to win this giveaway! P.S. I am really enjoying this quilt-along! Thanks for all your time! Thanks again for this quilt along. Can't wait to start putting my quilt top together today. I love how your quilt top turned out, great choice of colors. Thanks for offering the giveaway! I would love to win this batting and get started quilting my quilt. Your quilt top is great. Now to catch up. I would love a chance to win the W&N. It is a favorite of mine as well. Thank you for doing this quilt along and the giveaways. I can't wait to see how mine comes out. I'm so ready to start sewing my blocks together. Thanks for the giveaway. Thanks for the extra week - some of us will need it! Terrific instructions, and thank you for all of the pressing guidance: it's valuable to know that the time spent at the iron really pays off at the tail end. I could use the Warm N Natural too, this hobby is very addicting and good batting is pricey!